It seems to be unanimous; car paint care is always at the top of anyone's list when it comes to the cosmetics of their car! Unfortunately there is an over-abundance of bad information being repeated by unsuspecting and well-intentioned people. Add to the fact that we are on product overload; any trip down the car care aisle will cause your eyes to roll back into your head in anxiety overload! Do we really need this many choices in the way of car care products? Well if you ask the manufacturers, the answer is most certainly Yes! As an auto detailing professional I have to be able to know what works and what doesn't! It is as simple and basic as the ability to produce results. And the only way to produce acceptable results is by using products and techniques that actually perform, and can do so in the real world of auto detailing. Any frequent reader of my detailing sites knows I like to keep things simple. The forums are filled with so called "experts" who regurgitate glorified and exaggerated terminology, all with the attempt to self-inflate their position into something they are not! ( not that I have an opinion on the subject ). This is not only self-serving, but adds additional confusion to an already confused group of consumers. On top of this, we have an industry driven by an insatiable need to sell more and more product all in the name of profits. As consumers, we are bombarded with misleading and confusing marketing which is further compounded with inconsistent terminology; is it any wonder people are left chasing their tails looking for solutions. The fact is, car paint actually requires very little; the problem is that most people don't understand the few basic needs and requirements. Through the use and application of a few key car care products, the paint on your car can remain healthy and look amazing much longer than most people realize. Let me make this really simple for you: Outsourcing! The reality is that most people will consume and hour or more of their time simply washing the dirt off their car in the form of car washing. At this point, most people are so tired and have used up so much of their time, guess what gets neglected? You've guessed it; detailing! By consuming so much time on simple car washing duties, most people generally quit after this, and their car never gets any of the more critical steps of proper car paint care like waxing and other detailing steps. So my biggest recommendation to you is outsource the car washing duties to a local car wash.
Find a local quality 100% all cloth, or hand car wash.
Go during off-times to avoid the crowds. Find a car wash along your regular route of travels. Do not underestimate the necessity of regular washings to remove the superficial dirt from your car. Removing excessive build-up of dirt from your car is damaging in and of itself, so allowing your car to go weeks and months between washings will do its own level of damage. I could lay out all the individual car wash supplies and tools needed, or I can offer what I consider both the smarter option as well as the convenient option. Top rated in name in car care among enthusiasts and professionals. The exact wash mitt I recommend. Quality products to help you produce professional results. Comes with everything needed for a quality car wash experience. If you are still using dish soap to wash your car you need to abandon this practice. Any grease cutting dish soap is also going to be stripping any remaining wax you might have on your car, as well as an future wax you may apply. 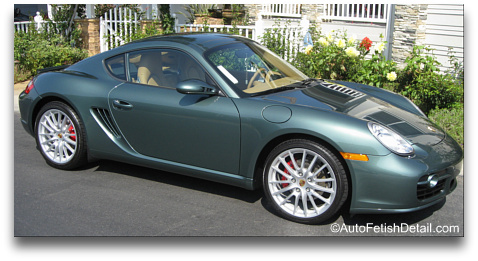 Using a quality car wash product is a requirement of proper car paint care. The second most common mistake is to use bath towels or terry cloth towels to dry your car after washing. Not only does this do a fair share of scratching, but will leave lint all over your paint. The drying micro fiber cloths contained in the above kit are absolutely the better alternative! Detailing clay remains one of the biggest unknowns to people. This amazing synthetic wonder is the answer to clean and smooth paint. Not to be confused with washing your car to remove superficial dirt, the clay bar is used to remove dirt and pollution that embeds into your cars paint; this is what gives your paint that unwanted texture. Normal washing and waxing will not remove these forms of embedded contaminates and proper car paint care must include regular use of detailing clay. The clay bar should be used prior to waxing anytime you start to feel any form of texture to your cars paint. Top rated name in car care. An all-in-one kit to decontaminate your paint. Use after you have just washed your car. Use before you apply any polishes or waxes to your car. If you have never experienced the use of detailing clay, you are in for an amazing experience and treat! I get more feed back from excited readers after using detailing clay for the first time than any other subject of car paint care. People just can't believe just how smooth and silky their car paint looks and feels after using this amazing "tool of the trade". This choice from Meguiar's will last you for years and deliver professional results in the process. Think of car wax as an invisible layer of protection. In addition, car wax fills in micro scratches and blemishes while creating a uniformed reflective layer to create gloss and depth to the paint. Consistent application of a quality car wax also remains as a critical requirement of proper car paint care. There are many choices when it comes to car wax products, and you could spend a lifetime researching them all. For the sake of keeping things simple, I am going to lay out my specific favorites. They perform in the real world of professional detailing. Simply put, they represent the winning combination of benefits and represent excellent car paint care products! Biggest Bang for Your Buck Car Wax! If you had to buy just one single wax product, you would have a hard time finding a better choice than the Meguiar's Ultimate Paste Wax. Not only do you get the visual performance of a quality paste wax which is ideal for any dark colored car, but you get the added protection made only possible with synthetic polymers; this product really has it all! One of my favorite car waxes. Professional results without breaking the bank. A maintenance wax is just that; a easier way to maintain the protection of your car in a product that is super simple and easy to use. Car paint care can be simpler and easier than you think; and this is one of those products that enables that. Can be used as a stand alone car wax, or as a wax extender to be used in between applications of the paste wax from above. The trade-off for such ease of use is less durability than that of the paste wax from above. This product is so easy to use, I use it as a quick detailer almost on a weekly basis. It also performs at such a high visual level, I can use it on black cars to achieve that just waxed look in fractions of the time a traditional paste wax would require. Same formulation as the Meguiar's Synthetic spray wax from their professional line. Save yourself time and energy by outsourcing to quality local car wash.
Use detailing clay prior to waxing to remove any form of embedded pollutants. Apply the Meguiar's Ultimate Paste Wax as base coat for protection and beauty. Use Meguiar's Ultimate Spray Wax to extend life of base coat, or whenever you want that just waxed look with an ultra easy to use product. I hope these tips has not only shown just how simple car paint care can be, but also help to renew that love affair you used to have with your car when it was brand new!